The Azalea and Azealia collaboration is no more. While Iggy Azalea and Azealia Banks once considered themselves rivals, both emcees have more than a name in common. Over the course of their careers, both Iggy and Banks have seen commercial success with massive singles "Fancy" and "212" respectively, but more importantly, both have fallen from the heights of promise, and currently stand as outcasts of the game. Iggy's Digital Distortion has been hit with leaks, delays, and general label disinterest, leading to public frustration from Iggy herself. And Banks? Banks' initial arrival on the scene was heralded with praise, with her debut album Broke With Expensive Tastes scoring critical acclaim. However, the young rapper was soon plagued with self-subjected controversy, from publicly airing out prolific rappers and producers, to throwing a fit and being ejected from Russel Crowe's party, as RZA's guest, no less. A few months back, Azalea and Azealia decided the time for trading petty barbs was over, and decided to bury the hatchet. In fact, the ladies even planned to hit the studio for a collaboration, which certainly came as a welcome surprise for fans of both artists. Unfortunately, as so often is the case, label business put a quick stop to those dreams. Even if you never planned on checking for this track, it's kind of depressing that Iggy has essentially become a prisoner on her own label. On one hand, her singles flopped, so Def Jam was justifiably wary of investing in her. 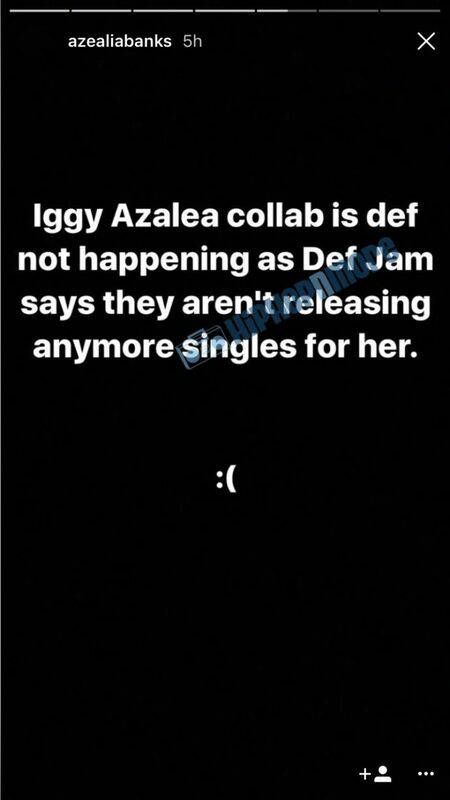 Yet Iggy remains contractually obligated to the label, and therefore cannot release music independently to garner a buzz. It's pretty much a catch-22 for the Australian rapper, whose career seems balanced in a purgatorial state. Maybe new Def Jam CEO Paul Rosenberg will change things up for Iggy Azalea when he takes over in 2018. What do ya'll think about this recent development?